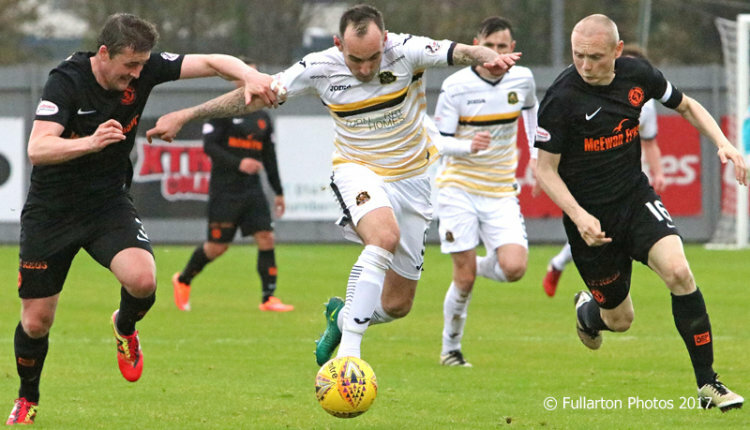 FORMER Dumbarton midfielder Sam Stanton netted a brace to give Dundee United a deserved victory over his previous club at the YOUR Radio FM103 Stadium. FORMER Dumbarton midfielder Sam Stanton netted a brace to give Dundee United a deserved victory over his previous club at the YOUR Radio FM103 Stadium in front of a 968 crowd. Stanton made it a bad start for Sons in just two minutes, curling home a fine shot from the edge of the area after United had exerted early pressure. It got worse on 16 minutes when he grabbed his second goal by slotting the ball through a busy penalty box and past keeper Scott Gallacher for 2-0. Three minutes later there were strong appeals for a Dumbarton penalty when David Wilson's cross looked to have been pushed away by an arm. But referee Craig Charleston gave a corner instead, from which Dougie Hill came close to pulling a goal back. Sons started the second half brightly, but without managing to test United keeper Harry Lewis. Just on the hour Dumbarton went down to ten men as Craig Barr, booked earlier for a foul, took a second yellow for simulation in the penalty area. Reorganised into two ranks of four, with Gregg Morrison up front, Sons dug in well but lacked bite when they broke, and neither side could find the net again in the final half hour. The Sonstrust Man of the Match was Dimitrios Froxylias. The picture shows Mark Stewart on the attack.